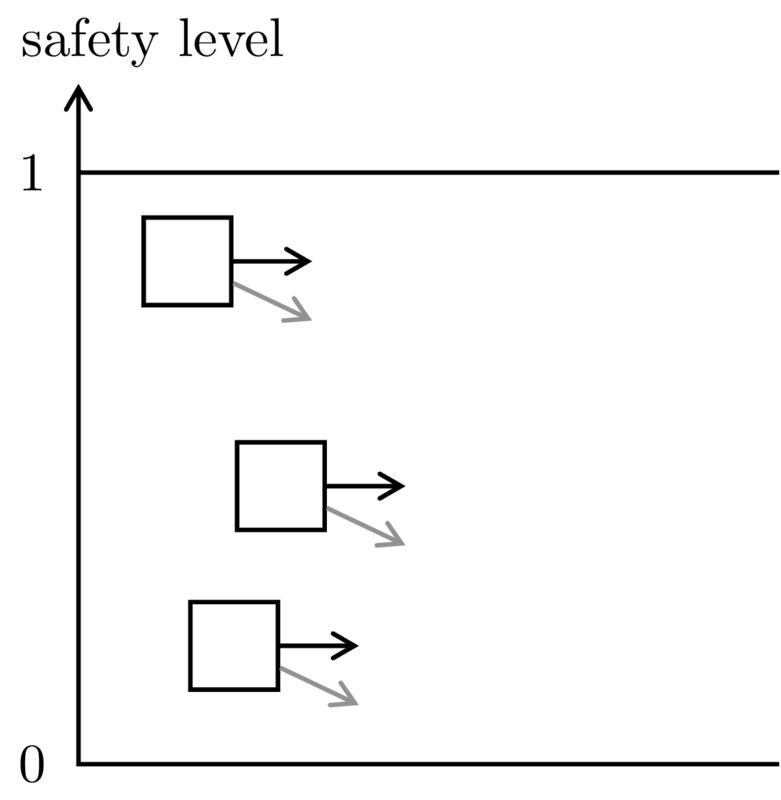 The random states come with a distribution over successor states, but in the controlled states a controller chooses a successor state (or a probability distribution over the successor states). For instance, the controller could stay on the leftmost column forever, by always choosing to go one state down. 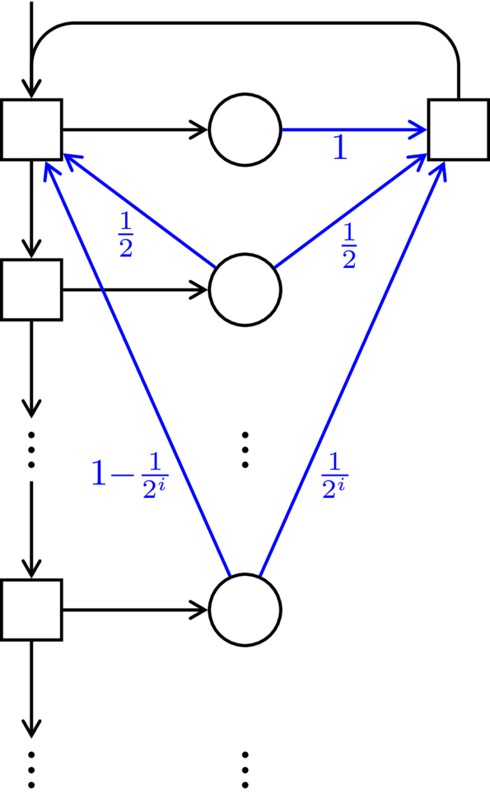 Or the controller could go right at some point; in the random state a successor is picked randomly, either the initial state or the state on the right, according to the blue probabilities. Since the controller wants to visit (infinitely many) green states, it needs to leave the left column at some point. But once it leaves the left column, there is a risk of visiting the red state before returning to the initial state. Visiting the red state is not a disaster, but it shouldn't happen infinitely often. How should the controller play then? Let's say a new round starts whenever we return to the initial state. Consider the following strategy: in each round go one state further down the left column before going right. Under that strategy, the controller visits green states infinitely often. One can show that, with probability $1$, the red state will be visited only finitely often. So under that strategy, the controller achieves the objective almost surely, i.e., with probability $1$. Achieving the objective almost surely is the gold standard in this post: we don't settle for less. We call a strategy winning if it achieves the objective almost surely. 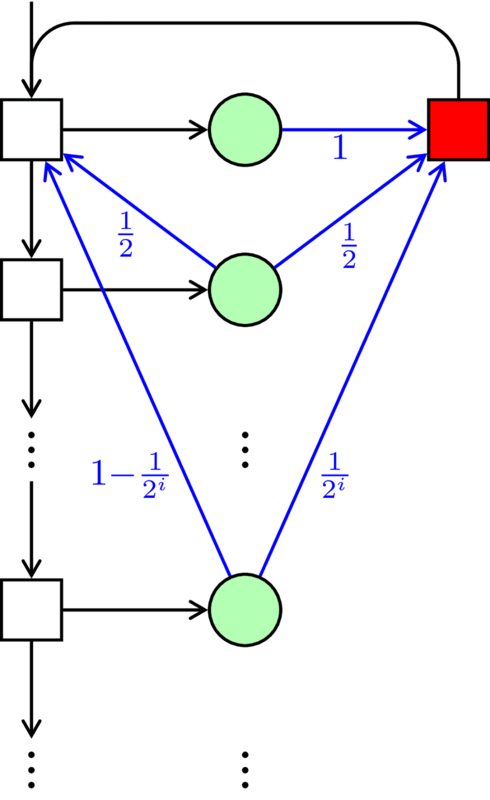 The described winning strategy (go ever further down) requires infinite memory: each time the controller visits the initial state, it needs to remember how far it went down in the previous round. In contrast, every finite-memory strategy loses with probability $1$. I won't define memory here, only "no memory": A strategy is MD (memoryless deterministic) if the controller assigns to each controlled state $s$ a fixed successor $s'$ that the controller chooses whenever it visits state $s$ (regardless of the history of the play). In the example above, every MD strategy loses almost surely (either because it never leaves the left column, or because it visits the red state infinitely often). Consider an MDP where for every state there is a winning strategy. If the MDP does not have white states (i.e., all states are green or red) then there is also an MD winning strategy. The same MD winning strategy works, regardless of which state is the start state. If a safety strategy succeeds in never visiting a red state again, then clearly it visits red states only finitely often. There are safety strategies that are MD (provided each controlled state has only finitely many successors, which we assume in this post). Safety strategies do not work though. Consider the following MDP and imagine that after the first random state the controller is unlucky and reaches not the first green self-loop but the second red state. The controller might reason: "Ok, I've been unlucky and am now in a red state. But if I go down one state, there is chance of $1/4$ that this was the last red state that I ever see. So let's give it a go." However, with probability $3/4$ the controller will be unlucky again. The controller might keep pushing its luck by playing "down", but the dream of reaching a green sink might move further and further away. Actually, the probability that this strategy (the safety strategy) succeeds is less than 72%. Compare this with the opposite strategy, which always returns to the initial state: that strategy is MD as well and succeeds almost surely! We conclude that playing only for safety is too impatient. Consider the MDP (visualized above) obtained by fixing a safety strategy for the states with safety level at least $1/3$ (the blue area). In this MDP, for every state there is a winning strategy. Consider any state. Since there is a winning strategy in the original MDP (before having fixed anything), the controller might play this strategy, until the play reaches the blue area. 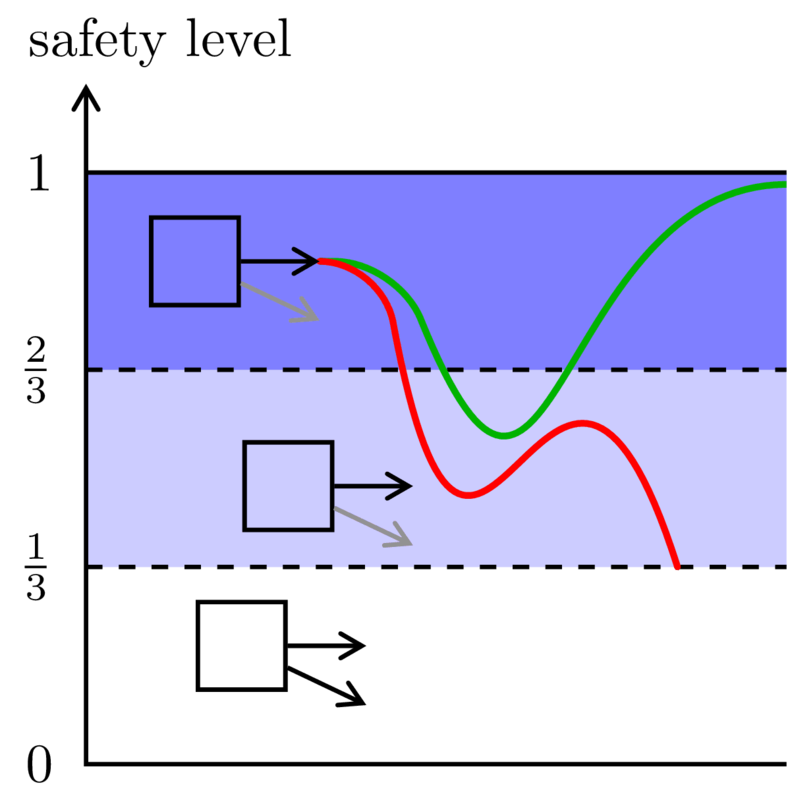 At this point the controller switches to a safety strategy (which is consistent with what has been fixed in the blue area). Now the controller has a chance of at least $1/3$ of never visiting red again and thus achieving the objective. If the play does reach a red state, the controller reverts to a strategy that is winning for that red state in the original MDP. 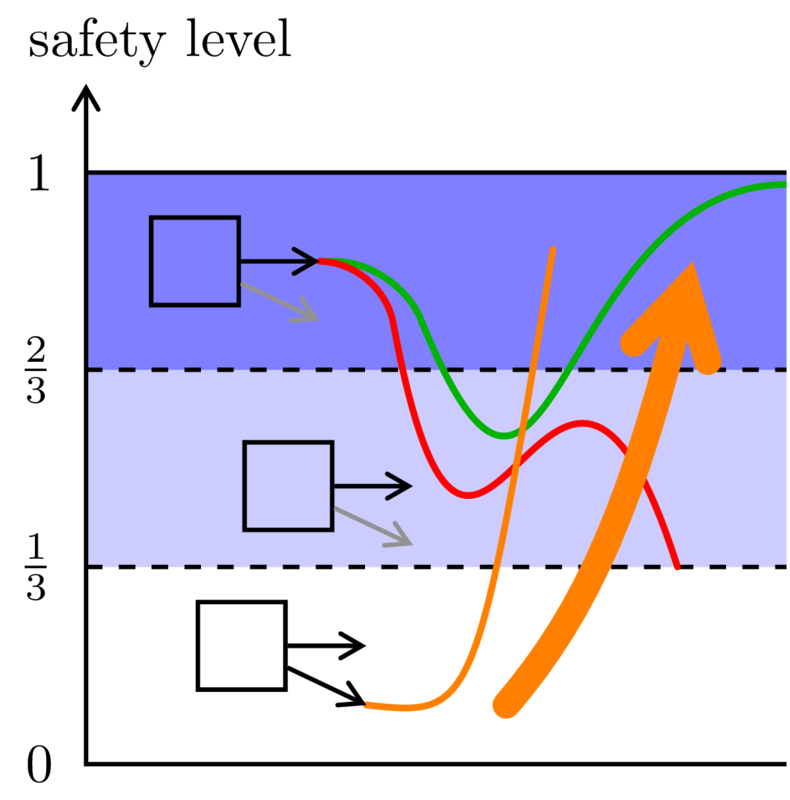 The controller follows that strategy until the play again reaches the blue area. At this point the controller switches again to a safety strategy, thus forever avoiding red with a fresh chance of at least $1/3$. Continuing in this way, the controller achieves the objective almost surely. Note that this strategy is not MD, as the controller needs to remember in which phase it is: at any point it either follows a winning strategy of the original MDP, or it follows a safety strategy. or it eventually leaves the blue area or visits a red state. The second case (dropping below safety $1/3$) cannot have very large probability: after all, we start in the dark-blue area with safety level at least $2/3$, so if the safety level is very likely to drop below $1/3$, we can't have been very safe to start with. Doing the maths shows that the probability of the second case is at most $1/2$. So starting in the dark-blue area, the probability of avoiding red forever is at least $1/2$. But is this just a pipe dream? After all, in the light-blue area we have already fixed a safety strategy. Perhaps that safety strategy prevents us from reaching the dark-blue area? Perhaps playing for safety in the light-blue area is greedy and short-sighted, and we should rather swallow the bitter pill and visit some red states for the greater benefit of reaching the dark-blue area? Consider an MDP where for each state there is a winning strategy. Then each state has a strategy to almost surely reach a state with safety level at least $2/3$. Consider an arbitrary start state $s_1$ and an arbitrary strategy. Suppose that $s_1$ has safety level less than $2/3$, so the probability of visiting a red state from $s_1$ is at least $1/3$. It follows that there is a finite number $k_1$ such that the probability of visiting a red state within the next $k_1$ steps is at least $1/4$. After these $k_1$ steps we are in another state, say $s_2$. Suppose that $s_2$ also has safety level less than $2/3$. Then, similarly, there is a number $k_2$ such that the probability of visiting a red state within the next $k_2$ steps is at least $1/4$. Etcetera. It follows that the probability of never reaching safety level at least $2/3$ and visiting only finitely many red states is zero. So every winning strategy almost surely reaches safety level at least $2/3$. So after freezing the blue area, there is still for every state a strategy to almost surely reach the dark-blue area. It is known that if there is a strategy to achieve a reachability objective almost surely then there is also an MD strategy to achieve the reachability objective almost surely. Reaching the dark-blue area is obviously a reachability objective. So there is an MD strategy to almost surely reach the dark-blue area. As argued above, this strategy, combined with the safety strategy in the blue area, is winning. In summary, here is our MD winning strategy: in the blue area play an MD strategy for safety (avoiding red states), and in the white area play an MD strategy for reaching the dark-blue area. The key idea is that these two MD strategies are not conflicting. The material in this post is from a LICS'17 paper by Richard Mayr, Mahsa Shirmohammadi, Dominik Wojtczak, and myself. An initial draft of this post was about how to make rankings more meaningful, a piece of mathsy computer science, as you expect it from this blog. My motivation is personal: I'm involved in selecting CS undergraduate students. Some people might be curious how Oxford admissions work: it's certainly a favourite subject for UK politicians and news media. Therefore I decided to postpone my original plan and to write this post about Oxford admissions. I hope I'm not playing with too much fire and the blog will not suddenly become famous for the wrong reasons! The tenor in newspapers and political campaigns is that the Oxbridge admissions process is “opaque” and unfair. Here I am going to offer transparency and some comments on fairness. The views expressed here are my own, and may not necessarily coincide with the university's views. There is a compact data structure for words: automata. Finite automata can “store” many words, even infinitely many—in the sense that the language of a finite automaton can be infinite. This powerful feature makes automata ubiquitous in computer science. Lecture notes by Javier Esparza emphasize this view of automata as data structures. operations, such as computing set union or complement of the languages of automata; tests, such as checking their languages for equality. In this post I focus on the latter: equivalence checking. In general, equivalence checking for automata is PSPACE-complete, which is excusable considering how compact and flexible data structures they are. One can check two deterministic finite automata for equivalence in polynomial time, by searching their product. Computer science is about leveraging mathematical structure, for instance, in order to accelerate algorithms. More often than we'd like we can't accelerate much: For instance, checking two NFAs for language inclusion or equivalence is PSPACE-complete. Even the problem whether an NFA accepts all words is PSPACE-complete. For DFAs, those problems are easy. This means that for NFAs we can't do much better than determinizing (using the subset construction and incurring an exponential blowup) and solving the resulting DFA problem. 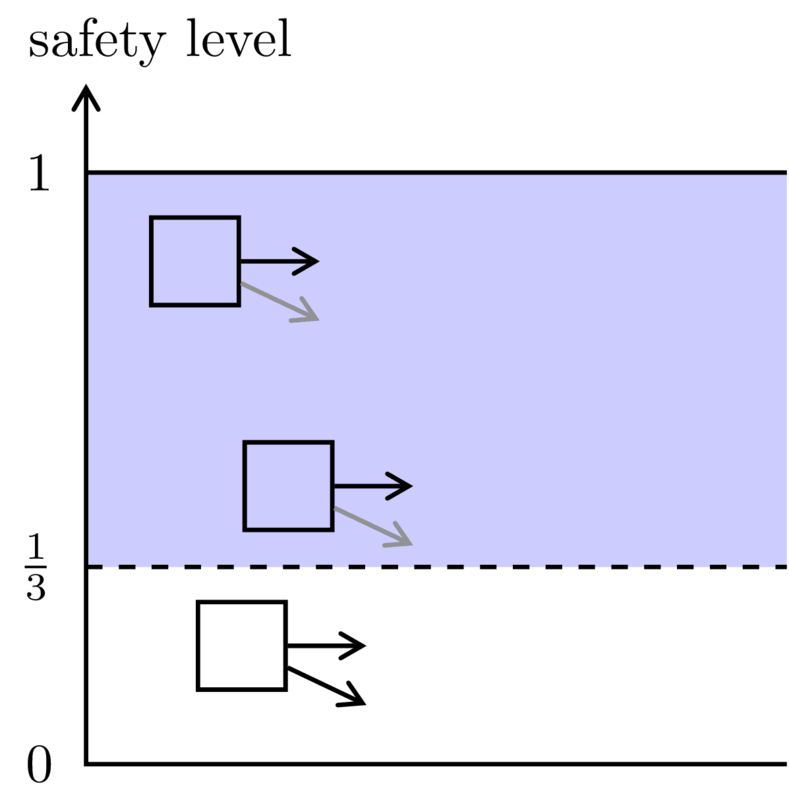 In this post I'll discuss an automata problem that seems to call for determinization and is, in fact, PSPACE-complete for NFAs. But there is an efficient algorithm for unambiguous automata.